Denny Jump (Bellevue, WA, United States) on 11 August 2010 in Landscape & Rural and Portfolio. Don Smith's book "On the Edge" has been so helpful to me and as I looked at this particular stage in the Saturday morning sunrise, I thought about some of the "learning points" in his book which are supported by totally relevant photographic illustrations, making the entire learning process so much easier for me. Here, we have what I like to call "The Edge of Sunrise" where night meets day, first light touches ground and water and, as a result, begins an ever-changing and unique process of events never again to be seen. Nice sun setting photo, Love the silhouettes in the front, adds another dimension. The colors -- the sun rays -- everything is just perfect! @Cruz: Thanks very much Cruz! I appreciate that. @Dimitrios, think positive. : Thank you Dimitrios!! stunning - I give it 5 stars as well! @Eric Cousineau: Hi Eric- Thanks very much sir! What a awesome shot! Well done. @Robbie: Hi Robbie - I appreciate your comment - thank you. Wow, even better than yesterday. You nailed it. @B. Thomas: Heavens! Thank you Barbara! I appreciate it. @Sunder: Thank you Sunder - thanks alot! @john4jack: Hi Jack - Thank you very much for that! I like the edge approach, with one side of the picture already golden and the other side just waiting for the touch of light. Great photo. @Andrea: Hi Andrea - Thanks very much - Yes that's how the clouds were behaving at that timne - made it interesting for sure. @Marie LC: Hi Marie - Thank you so much - I like your stairway photo. Lovely composition, sunrise is often a wonderful moment and you've captured this one perfectly. @Evelyne Dubos: Hi Evelyne - Thank you - I also like your photo today ! @Surubhi: Hi and thank you very much for visiting my blog ! Nothing could be more lovely than a sunset like this :) Beautiful ! @MARIANA: Hi Mariana - Thank You very much! A breathtaking scene, with the sun perfectly placed. @Curly: Thank you Curly! All the Best! 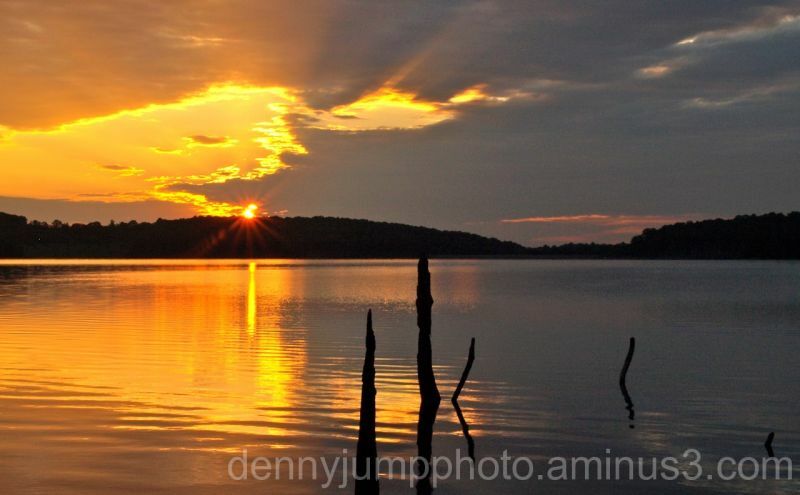 A stunning capture, Denny! The colors and reflections are beautiful. It's amazing how much the color changes as the sun rises. And the colors do so much for the mood. Your "Dawn's Mirror" had much more blues and pinks. A nice shimmering gold on the water here. @Steven: Thank you Steve - it was amazing watching that transpire and the water certainly does add another dimension Thanks Again! Love the golden reflection on the lake! Stunning shot! Would love to be there right now! @Wild Mustang Photography: i Pan - it was really cool let me tell you - light and reflections changing by the minute. Thanks very much! Check out that sunstar! The reflection is gorgeous. Very nice work, Denny! @Julie Brown: Hi Julie - Sorry i imssed this! Thank you so very much! Beautiful sunrise image with those wonderful reflections and the excellent silhouettes of the posts in the foreground giving a nice interest and balance to the sun, almost like witnesses. The sun and its rays are just gorgeous. @Bettina: Hi Bettina - thankyouvery very much - you are so kind! another beauty! The rays and reflection are amazing! stunning. @Becky: Hi Becky -sorry, i did not see all of these - Thank you dear. Friday is supposed to be the day! I'll keep you posted. An absolutely gorgeous sunrise capture with a wonderful starburst! @Bill Brown: Bill I am so sorry - i did not see this - thank you so much for the really nice comment here -I really appreciate it sir! First off - a beautiful image. Secondly, thanks for the plug for my book. I hope it is helping you find interesting images. They are everywhere in nature once we know when/where to look. Hope you are having a fantastic day Denny! @Don Smith: I am here slaving away at work but you have made my day - Thank you so much Don and you are MOST welcome. I won't go on - I know you are getting ready for Big Sur - all my best to you and Gary for a great workshop! Stunning! This is so beautiful. Bravo! @Skyriani: Hi Skyriana - I completely agree - I love sunsets and sunrises. Thank you so very much for checking it out! Nice colors, reflection and a sunstar...Great shot ! Now you see why I loveeeeeee that place! Greatly captured my friend, so tranquil! love the effect you got goin on with the sun here, kinda reminds me of the art deco sun rays, beautiful shot!!! @JD: Hi JD - Thank you very much! indeed, a place to sit, reflect, and be quiet. wow.